European Simon Says | Europe Is Not Dead! Portuguese young children play the game on behalf of their King. Well… we all know that Portugal has no king since 1910, but the Portuguese game master still commands his troops with the sentence “O rei manda” which means “the king orders”. It is not really clear when the game appeared in Portugal and to which king it actually refers. We could nevertheless imagine that the “king orders” refers to the Golden Age of Portugal when the monarchy initiated what would be latter known as the Age of Discoveries. This anonymous king might well be King Henry who was responsible for the early development of Portuguese exploration and maritime trade with other continents through the exploration of Western Africa, the islands of the Atlantic Ocean, and the search for new routes… or it could just as easily be another king… Who knows? The first name “Simón” is not very original in Spain and was quite popular back at the beginning of the 20th century. This is maybe the reason why Spaniards kept the same name for their game master as in the English version. Or it could also be because “Simón” is a typical surname in Spain as well. According to statistics, “Simón” is the 186thmost common surname in Spain, with 27.178 people bearing it as first last name and 26.016 bearing it as a second last name. More surprisingly, 339 people in Spain have both “Simón” as their first and second surname, such as “Manuel Simón–Simón”. Not very convenient for email adresses but quite useful for the Spanish version of “Simon says…” where they could bear the ultimate title of double game master! Let’s be honest: I would strongly recommend you not to play “Símon segir…” with Icelandic native speakers, unless you are yourself very fluent in Icelandic language and confident that you can make it! Still eager to play? Well, let’s start then! “Símon segir: settu höndina á hné þér” You don’t know what to do? It was however simple, it meant “Simonsays: put your hand on your knee“! Ok, that was a first try. I’ll give you a second chance: “Simon segir, hrista vinstri fætinum” You seem puzzled… but you should have known that you had to shake your left leg… Do not loose hope, I’ve got a last one for you and this time, I will give you some tips: “rétt upp vinstir höndina” (“rétt upp” means ‘raise high’ and ‘vinstir höndina‘ means ‘left hand’). So this one, you got it! Have you raised your left hand in the air? Nice! But I didn’t say “Simon segir…”. So you’re eliminated from the game… sorry! Have you ever asked yourself why ‘Simon’ is actually called ‘Simon’ in the game? His name is in fact a reference to an historical statesman: the 13th-century French-English noble Simon de Montfort. De Montfort’s reputation for commanding authority comes from his actions during the Second Barons’ War in medieval England, where he imprisoned the then king, Henry III, and replaced him with the era’s first democratic parliament. For the next year, any order Henry III gave could have been countermanded by de Montfort, until his defeat at the Battle of Evesham. It is also possible that the name has no such meaning, and the name ‘Simon’ would have simply derived from an alliterative effect. Regardless of where it came from, ‘Simon’ would eventually give its name to one of the most popular electronic toys of the 1980s, the circular, friendly-looking… Simon. The closest equivalent of “Simon says…” in Netherlands would be the game called “Commando pinkelen…“. Just like in Germany with “Kommando Pimperle“, players have to sit around a table and rehearse several commands before the game master starts the game. Orders can be “commando bol” where all players have to put their hands open on the table or “commando hol” where all players have to put the back of their hands on the table. Players will have to perform the action only when the order begins with “Commando”, otherwise, they should ignore them. Apart from the general commands, the game master can also add some difficulties by later adding new commands such as ‘stand’, ‘sit’, ‘high’, ‘low’... There is also an alternative, to do only what the game leader does and not what he says. In Belgium, of course, the game “Simon says…” exists in both languages, Flemish and French. One should even add that German is another official language of Belgium, so that you wouldn’t be surprised to hear about “Kommando Pimperle…” in the German-Speaking Community in Belgium. Without surprise then, children of the Walloon region and Brussels would rather play to “Jacques a dit...”. However, Flemish children would not play to the Dutch “Commando…” as in the Netherlands, but rather to “Jantje zegt...” And the name of Jantje, made out of the surname Jan, has a peculiar historical meaning. It was actually the nickname Flemish speakers gave to young and dauntless sailors on a boat. Throughout time, it even became the name given in Dutch to the little brat in children’s jokes – the equivalent of Little Johnny in English. The German version of “Simon Says…” is very similar to the English version, with few variations. The game master gives commands that participants should implement – or not. The players have to sit around a table and agree and rehearse several commands such as to ‘put the forefinger on the table‘ when the game master says “Command: pimperle!”, to ‘put the hands up in the air’ when he says “Command: high!” or ‘to put the fist on the table’ when he order “Command: Faust!”… The relative difficulty is to perform the action only when the order begins with “Command”, otherwise, it has to be ignored. The (nasty) game master can always try to perform the action himself to confuse the other players. Games of this kind have a long tradition in Germany and were already played in the Courts of Kings, as Goethe’s Faust testifies. It probably used to be recreational pleasures for ladies and their admirers… Who said “Simon says…” was a children’s game? It’s rather unclear whether the game “Simon says…” actually exists in the Italian peninsula as some Italian natives seem not to know the game. The game is for sure not as famous as in other European countries. So it comes without surprise that Italian teachers just translated the English name of the game to simply call it “Simone dice…” in Italian. That’s just a pity, as Italians also had a famous Simone as admiral who is remembered in Italy to be the originator of the modern Italian fleet. Simone Antonio Pacoret de Saint-Bon took part in the Crimean war, distinguished himself in 1860 at the siege of Ancona, and was decorated for valor at the Siege of Gaeta. Appointed minister of marine, he revolutionized the Italian navy, insisting upon the need for large battleships with high powers of attack and defense, and capable of fighting as single units. With all due respect, “Simone dice...” should have thus been the originator of the Italian game. It seems that the “Simon says…” game inspired many artists in Poland as one can find both songs and sketches named after the game “Szymon mówi…” In the eponymous song by Letebra, the lyrics say “Simon says: grasp the cube/ Simon says jump on one leg/ Simon says politely: eat the fish/Be free, die!”. If you don’t really understand what is meant here, you are not alone! Szymon mówi kabarety is also the name of a band of TV stand up comediansperforming sketches in Poland. This award-winning program had its television premiere in December 2001. The program included, among other things, parodies of famous scenes from international and Polish cult movies. But do not worry, “Szymon mówi…” remains also a popular game for Polish children who play it home or at school. You might not know it, but hungarians have some know-how when it comes to games. They are, after all, the ones who invented the rubik’s cube. But this time, they seem to have just imported the English game with its own name, as “Simon mondja…” literally means “Simon says…“. As you are dying to know what “Simon says…” sounds like in Hungarian (aren’t you? ), here are some examples of orders: “Simon mondja: hogy guggolj le!“ (‘Simon says: sit down’), “Simon mondja: emeld fel a kezed!” (‘Simon says: raise your hands!’) or “Simon mondja: emeld fel a jobb kezedet!” (‘Simon says: raise your right hand!’). It seems that the game is quite used by Hungarian teachers to teach young children to better know their body parts. 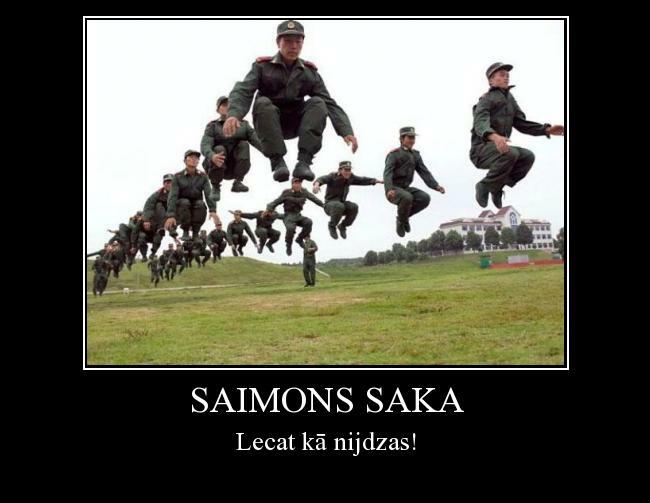 Sure, by now, you have guessed that “Saimons” is the Latvian equivalent of the name “Simon”. So it comes as no surprise that the Latvian version of the game “Simon Says…” is actually called in Riga “Saimons saka…“. Well, it’s not really sure if the game actually exists in Latvia after all, as one can find very few information on its existence and translation. But some online searches brought me to find this quite funny picture – it’s self-explanatory, you don’t need to speak Latvian to understand what is meant here! If you are Latvian and have more detailed information on the equivalent of the game “Simon Says…” in your country, please do not hesitate to contact me! There is not much known on the game “Simon Says” in Estonia, except that it exists under the Estonian name of “Simon ütleb…“. The mere information that one can find online about “Simon Says” in Estonia, is actually related to a metalcore music band from Narva with the same name. But of course, it has nothing to do with child education, unless you want the children to play the game with metalcore music in background. If you are Estonian and have more detailed information on the equivalent of the game “Simon Says…” in your country, please do not hesitate to contact me! Dear Romanian and Moldovan friends – I must confess that it is rather difficult to find the true equivalent in Romanian of the game “Simon says…” It happens that some say that the game would be called “Răzvan spune…“, others say it is rather “Simon spune…” while others eventually support that it would be “Păcală spune…” With all those contradictory information, you can easily understand how puzzled I am! If you pop up on this page and read this, and if you have the answer, I would be very grateful if you could share your answer with me so that I could complete this list and be the most accurate possible! How to play “Simon Says…” in Slovenia? Well, basically the same as in other countries. The Slovenian website gamehobbies gives you the rules, in case you need them in Slovenian. “This game requires minimal adult supervision and no preparation. One adult or child is called “Simon” and will be the leader who will give out orders to the rest of the players. The orders must start with the term “Simon pravi” for instance: “Simon says… jump up”. All players must perform the action. But they should ignore all commands that do not start with the phrase “Simon says.” Every child who is too slow to perform the command from Simon or who perform the command, which did not start with the phrase will be out of the game until the next round. The winner is the remaining child, although more than one child can be declared winners if they were particularly good”. Now you have the full rules! It is rather unsure whether the game “Simon says…” has ever been played in Albanian playgrounds. What is nevertheless certain is the fact that “Simon” has been translated in Albanian with “Arta” by the Program of Early Intervention and Education Manual to be used for the Summer School for children with Down’s Syndrome! We can presumably guess that the translator just chose as an equivalent of “Simon” the name of an Albanian celebrity, Arta Bajrami, a very well-known singer, extremely popular among the young Albanian audience in Albania, Kosovo, Montenegro and Macedonia. Arta is also known as The Albanian Queen of R&B because she was one of the first singers to introduce an R&B style to the Albanian public. This makes in any case the only female representative of this list! Here we are! Eventually in Greece. But the game “Simon Says…” is there unfortunately just a transposition of the English version where “Ο Σάιμον λέει…” is a mere translation of “Simon Says…”. In the great Greek folklore, we would have loved to play “Panayotis says…”, “Apostolis says…” or “Polychronis says…” (yes, those names are Greek!) But we will have instead to call a simple “Simon” to do the job. So let’s take comfort by reading some of the commands that one could hear while playing in Greece: “Ο Σάιμον λέει: να πιάσεις το γόνατό σου” (“Simon says: grab your knee”), “Ο Σάιμον λέει: να βάλεις το χέρι σου στο αυτί σου” (“Simon says: put your hand on your ear”), “Ο Σάιμον λέει: να πιείτε νερό” (“Simon says: drink water”) or a quite useful one if you want to kill two birds with one stone: “Ο Σάιμον λέει: να πλύνετε τα πιάτα” (“Simon says: wash the dishes”). If you liked this article, you may also like European Monopoly Streets, Little Johnny, Surnames and Fairy Tales.